Data Management asserts allow for a quick and easy way to compare and validate data. These asserts can compare large amounts of data with one simple assert. Dimension Validation Structure Defines the grid validation rules. Grid The grid resource that's validated. 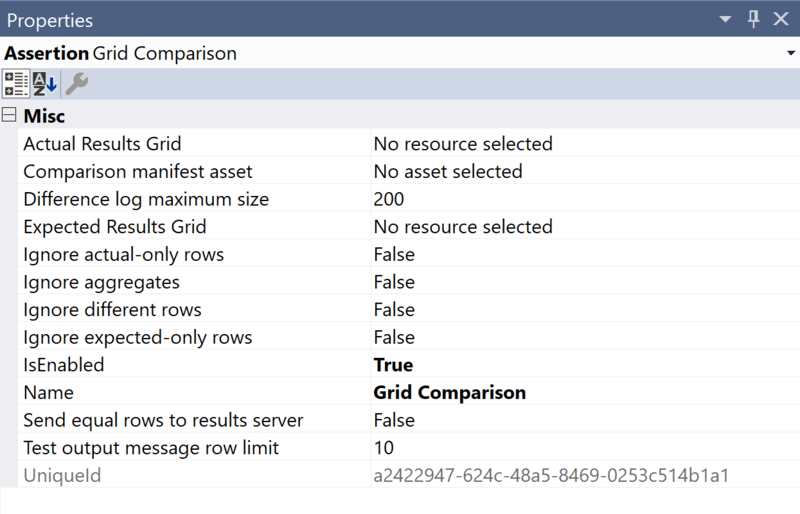 The Grid Comparison assert compares two grids, and expects both sides to be equal. You can specify different criteria for the comparison. Difference log maximum size The maximum number of rows to send to the SentryOne Test Web Portal if the test group is configured to send results to the server. Ignore aggregates Specifies whether to ignore aggregate comparisons. Ignore different rows Specifies whether to ignore rows that differ. Ignore expected-only rows Specifies whether to ignore rows only appearing in the expected grid. Ignore actual-only rows Specifies whether to ignore rows only appearing in the actual grid. Include equal rows Specifies if rows that match are sent to SentryOne Test. By default, only rows that differ or exist on only one side of the comparison are sent. Expected results grid The grid of expected results, the result set that we want our test to match. A previous action loads the grid to a specific resource key. Comparison manifest asset The comparison manifest asset that determines the items to compare. Actual results grid This is the grid of actual results, the result set that our test produced. A previous action should load the grid to a specific resource key. Test output message row limit Specifies the number of detail rows to include in the error message. The Grid Validation assert is used with a Validation Manifest. The assertion uses the rules outlined in the Validation Manifest and runs the asserts to validate the grid. Grid The grid you want to run the validation against. Grid Validation Manifest The validation manifest containing the validation rules used in the assert.